2nd January 2015: The crossroads of ‘…ooooh, I mustn’t…’ and ‘…aargh, F#@& it!, I’m gonna eat it…’. If you’re here, right in the epicenter of that diet conundrum, divert your eyes and stop reading now. Raise your hand if you’ve ever felt all proud and accomplished for having chopped up a wickedly healthy salad… only to then slather it in 500 calories worth of dressing, with buttery croutons to boot. You’re not alone! If it weren’t for the tang of dressing, I probably wouldn’t be all gung-ho about salad either. As a matter of fact, the creamier the dressing, the easier I find it to eat raw leafy greens, after all, I’m not a goat. Frankly, anyone who proclaims to enjoy salad without dressing is a shameless liar; a Spartan… or a farm animal reincarnate. I’m not above Buddhist philosophies, y’all. The other day, I bought a Costco-sized tub of sour cream. I don’t even know how many ounces is in that cradle of tangy deliciousness, but at $3.79 it was practically the same price as a much smaller tub you’d buy at the regular grocery store and that’s all the convincing I needed to heave that sucker into my cargo ship cart. I’m not sure what I was thinking, but it’s safe to assume that my mind wasn’t on any New Year’s resolutions. With a tangy sour cream base, the dressing below can be spooned straight out of the jar drizzled over salad, but should you feel rebellious, you can use steamed artichoke leaves as a vessel to bring this deliciousness into your gaping mouth as well. I confess that I know nothing about American football. Well, almost nothing. I know that the Minnesota Vikings’ uniform colors are purple and GOLD!, not yellow. It looks pretty yellow to me, but who am I to judge?! I also know that you’re not supposed to hold a conversation during the game for longer than, say, 30 seconds. Commercials is when your verbal diarrhea is tolerated. And I know that you’re not supposed to jump up with arms extended and a loud ‘HELL YEAH!! !’ when there’s a flag against your team. A flag is evil… and a tat effeminate, if you ask me, but I’ll hold my vile tongue. I have no clue what all the conferences mean, let alone how they stack up against each other. I’m truly a lost atom in the football vortex. I understand just about as much from football as I would from any scientific debate in Norwegian, and that notion is aggravated by the fact that I can’t even keep football and baseball straight. I kid you not, 90% of the time, I still think the Red Socks are a football team! Ouch. The kicker is (ain’t that a nice pun?! ), I actually enjoy watching football. Very much like the cats. I don’t per se lounge on the ottoman like a jezebel and elaborately start grooming my nether regions, but – like the resident felines – I’m pleasantly entertained by the movement on the screen. I like seeing all the pretty colors. And then there is Mr. Farklepants too, with his spontaneous loud outbursts of approval and/or animated annoyance about certain referee calls. Watching him watch football, amuses me. I’ll come right out saying that there is no specific team I’m a fan of, and as such, I mostly root for the team wearing the prettiest colors the team that pleases my visual cortex the most. Contrary to what I just stated (I am female after all), the Seahawks will always have my vote because a) I have very dear friends in Seattle and feel a misplaced loyalty to their team, b) Seattle is quite possibly the coolest city in the USA and c) Pike Place Market. Enough said there. What I like best about the ‘Super Bowl’, though, is that it comes with a widely accepted ‘diet pardon’ that makes it OK to stuff your face with chips dipped in whatever melts into a tasty homogenized blob in the oven. 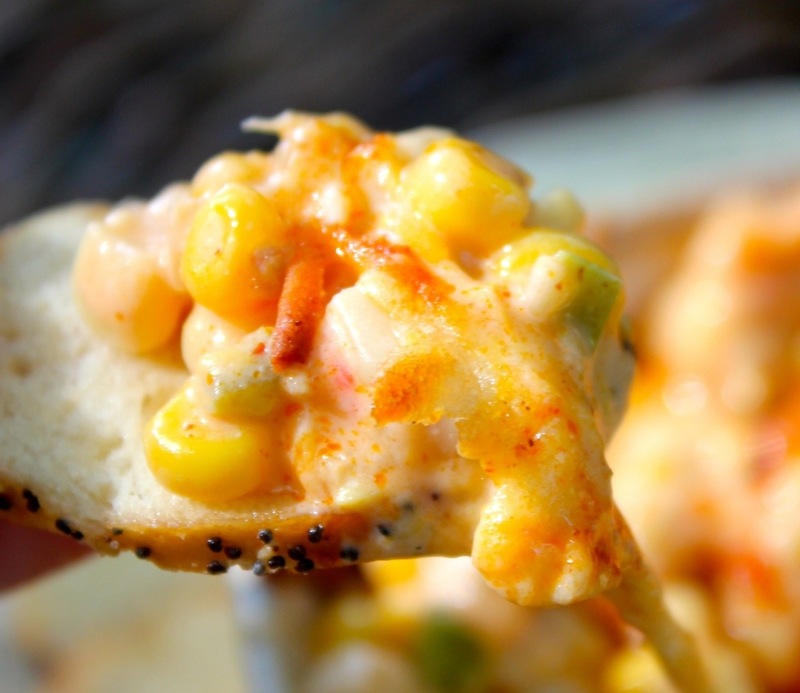 A while ago, I found a recipe for a hot blue cheese & onion dip and, true to my non-conformist nature, I turned that deliciousness into a corn version… with a bit of help from Pinterest. It was love at first bite. – 2-4 Tbsp of Sriracha sauce, depending on the level of spiciness you desire. – 2-3 green onions, for garnish. If using frozen corn, take out of the freezer and let it defrost in a sieve, allowing the thawing juices to drain. If using fresh corn, cut corn off of the cobs and set aside. I prefer fresh when in season, but either works just fine! In a skillet (I use my 12-inch Lodge Cast Iron skillet), sauté the shallots and bell peppers until beginning to soften. Turn off the heat and add reserved corn, allowing the corn to cool down the skillet just a bit. In a bowl, mix cream cheese with mayo, sour cream, Sriracha Sauce & Monterey jack cheese. Add salt to taste. Add cumin & corn mixture from skillet and mix until well combined. Either pour mixture back into skillet or pour into an oven-safe casserole dish. Top with a little bit of Monterey jack cheese, and bake uncovered for approx. 30-40 min, until mixture is bubbly. Slice green onions finely and sprinkle over top of dip. Serve hot, with tortilla chips, crackers or crusty French bread slices. 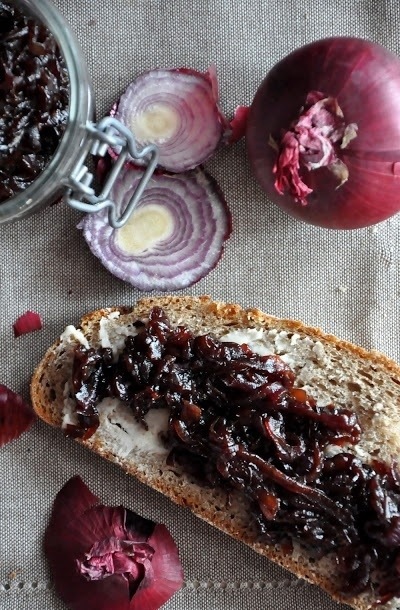 A few years ago, during a random browsing session at Williams-Sonoma, my eye fell on a small jar of balsamic onion spread. With a $10.99 price tag, I decided it was entirely too expensive so I bought it anyway. For a little while I smeared it on anything from bread to crackers and grilled cheese sandwiches, until I could see the glass bottom and went into full-blown panic mode and rationed it as though the end of civilization was nigh. So when my mom arrived for a visit some weeks later, we picked up a few gorgeous cheeses and a loaf of crusty French bread at the farmers market for lunch one day. As I was setting the table, mom came upon my nearly empty jar of balsamic onion spread, tucked in the back of my fridge, where it was shielded from impulsive midnight snacking. I think she must have seen the frantic expression in my twitching eye, cause she grabbed it and dismissively announced that wherever it came from she was sure they had more. Later that afternoon, one sales rep at Williams-Sonoma in Palos Verdes, CA became employee of the month for a record sale of balsamic onion spread, financed by the ‘Bank of Mom’. With onions being fairly inexpensive, and fueled by my degree in Business, I figured their profit margin on that drug stuff must be sky-rocketing high, and so I set out on a quest to recreate my precious anything-spread. Only, I’d make it even better. There was some unpalatable trial & error, and a fair amount of spontaneous gagging, but in the end I came up trumps with something that is out-of-this-world delicious. The addition of bacon was real stroke of genius, but you can leave it out if you prefer a vegetarian version. For your BBQ pleasure, I also smear this deliciousness on a Brioche bun, and top a crusty browned beef patty with some blue cheese, a fried egg and arugula, for a killer-hamburger that has just the right amount of ‘wrong’! (*) I used a lovely blackberry balsamic vinegar I found at the Torrance farmers market, and it gave this jam an even sweeter & fruitier touch. Heat a large Dutch oven over medium-high heat. Add the bacon pieces and cook until browned but not crispy, approx. 5-8 min. Remove the bacon from the pan and let it drain on a paper towel-lined plate. Drain off all but 2-3 Tbsp of the bacon grease and then stir in the onions. season with a pinch of salt & pepper, to taste. Saute the onions for 2 min. then add a splash of cooking sherry, and scrape the browned bits off of the bottom of the pan with a wooden spoon. Add the blackberries, cover the pot and cook the jam until the onions are soft and brown, and the berries have broken down, approx. 15-20 min. Stir in a small pinch of cayenne pepper, the balsamic vinegar, mustard, and remaining sherry, and add in reserved bacon. Bring the mixture to a simmer and simmer uncovered until the sauce thickens and is almost completely absorbed, approx. 10 min. The jam should be a dark rich brown at this point. Allow to cool and refrigerate in an airtight container for up to a week. I have a confession to make. Until I set foot in the USA, I had only vaguely heard of salsa. Let alone that I knew what it was supposed to taste like. As a matter of fact, the first time I tried it, was at a grungy roadside diner located across the street from my then office in Rockaway, NJ… Let’s just say that it was an overly sweet, jarred disappointment. It wasn’t until I set foot on California soil that my taste buds were properly courted by the smooth Latin lover that is ‘salsa fresca’. Mom is an adventurous amateur chef, so it baffles me a wee bit as to why I didn’t really hear about salsa until I came to the USA. Frankly, growing up in Belgium and vacationing frequently in sweet Provence, we were surrounded by juicy tomatoes fresh from the vine every late Spring & Summer. When we moved into our new house in the country, mom even planted a few odd tomato plants against a sunny wall we shared with our neighbor. It so happens to be that those tomato plants set off a royal feud with Mr. Grouch, who never got over the fact that our yard was twice the size of his, and who vehemently claimed that watering our tomato plants caused structural damage to his garage’s wall. He was a royal pain in the you-know-what, and I won’t even go into detail about what happened when my soccer ball went over the fence and landed on his prize-winning dahlias. I don’t think the food blogging world could stomach the horror of such atrocity. But we digress… I think the problem with Flemish salsa may have been that things like limes, fresh cilantro and jalapenos – the latter being imported into Belgium and so by default ‘expensive’ – were either not in our family’s budget or not readily available… or mom didn’t care for them, which is the least likely of all three. 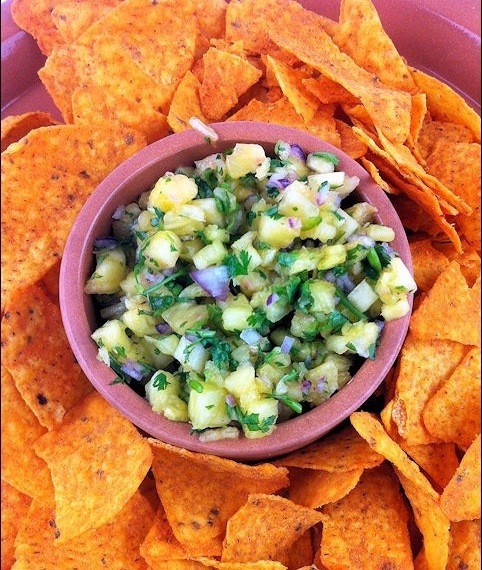 Mom is madly in love with fresh salsa & ‘pico de gallo’. During her weeklong California visits, she single-handedly powers through 2-3 family-size (!) containers of the stuff from the ‘salsa man’ at Torrance farmers market. She even engages in pseudo-English conversation with the man, using partial hand gestures and broken soap opera English. (*) She likes his stuff that much! Yes, the salsa man and my mom share a special bond. (*) Like the time she walked into a grocery store in Spain, intending to buy cat food for the strays, sans knowledge of any Spanish, and resorted to signaling out “cat food” by pointing into her wide-open gaping mouth and uttering ‘meow meow’ to the unassuming store clerk. Per God’s blessing, I wasn’t present for this linguistic embarrassment. With a great variety of fresh, flavorful salsas readily available here in Southern California year-round, I’ve never been challenged to come up with my own creation. I also don’t own a food processor, an excuse I’ve used far too many times to justify my salsa laziness. Now that I’m trying to live a little healthier with more ‘whole’ foods and fewer manipulated foods, I’m trying to move away from the jarred stuff which often contains ingredients that sound like they could be Klingon. No offense, Trekkie fans! The fresh tomato kind tends to come in the same boring old flavors, and I wanted to try something new. I can’t wait for my mom to be here in October, so she can then tell me in her dry, ‘matter-of-fact’ teacher voice that the tomato stuff from the salsa man is better. I’m fully prepared to embrace that defeat…! 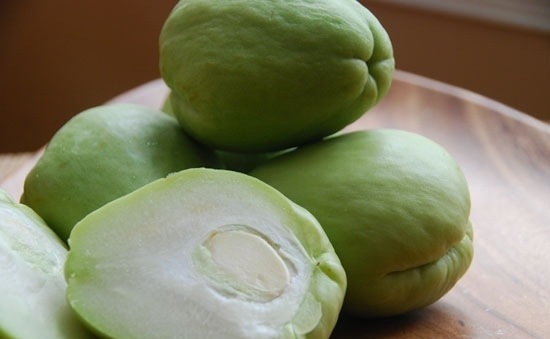 (*) If you’re not familiar with chayote, see picture below, you should know that they have a crisp, cool flavor similar to cucumber. The flat, almond-shaped pit inside is edible too, but I remove it for this salsa. Place all ingredients in a bowl, and gently fold together to combine. 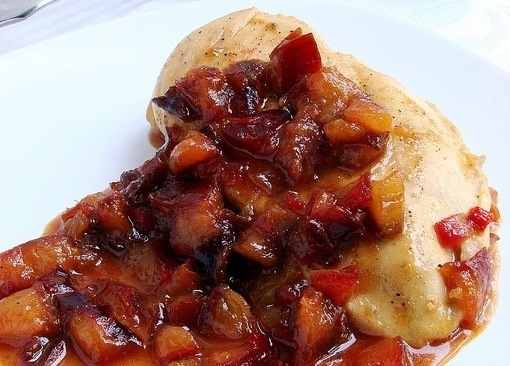 Let ‘rest’ in the refrigerator for a few hours, so flavors have time to develop and meld beautifully. I don’t know about you, but my mind has been on Fall lately. It may be because my morning commute has been blanketed in coastal fog the past few days, or perhaps I’m excited about my mom’s pending visit from Belgium in October. Either way, I’m over the California Summer heat and I want Fall to get here already. Tucked in the Northeastern corner of Belgium, is the province of Limburg. With its rich, fertile soil, the region is dotted with fruit growers and groves. Whilst cruising on the rural byways in Spring, you drive in a cloud of pinkish white petals from all the blossoming orchards that produce enough fruit in Fall to stop world hunger for a few months. Sint-Truiden, one of Limburg’s finest cities in the heart of the apple- & pear producing region of ‘Haspengouw’, is truly the Oak Glen of Belgium. There is a lot of friendly mockery when it comes to Limburgers’ heavy local dialect, but if you ask me, the province has so much historical beauty and peaceful homestead allure, that there is little else to mock but the country twang of its inhabitants. I remember my brother & I being sent off to Scouts Camp for a few weeks every year during our 2 month Summer vacations, and many of these camps took place somewhere in Limburg. We’d pitch our tents in the woods or on the heather-covered hills, and – being giddy tweens – we’d make fun of the local boys during scavenger hunts in which we left our campground and skipped across the rural towns in search of clues. During these outings, for which we were sternly lectured by camp staff as to the do’s and don’ts and the potential consequences we’d face if we broke the rules, we’d often slip into the orchards to celebrate our freedom from camp regulations and share our deepest camp secrets underneath the shady canopy of an apple tree. The utmost privacy of our secrets being sealed by a pinky swear and the solemn promise to always be friends. Apples & pears are staples in Belgium’s culinary repertoire. From ‘Luikse Stroop’ to ‘beer-braised rabbit with prunes’, Flemish cuisine often marries stewed or roasted fruits into its regional specialties. I love the savory & sweet combination of these flavors, and for that reason, chutney is winner in my book. I’ve played around with chutneys here & there, but it wasn’t until I came across a mango chutney recipe from an old edition of ‘Bon Appetit’, that I knew I had a winner on my hands. Since I love pears, I tweaked that recipe a bit to favor pears and… voilà! Get some cheese & crackers, and you’re all set for a true Belgian Fall favorite! Toss the pears with the lemon juice, 1 tablespoon of the sugar, the cinnamon, and cloves. Line a baking sheet with aluminum foil and coat the foil with half the oil. Set the pears cut side down on the pan. Brush the pears with the remaining oil, and roast until caramelized and tender, approx. 40 to 50 minutes. Take out of the oven, and set aside to cool. While the pears are roasting, bring all of the remaining ingredients to a boil in a non-reactive saucepan (like a Dutch oven). Reduce the heat and simmer for 5 minutes. Remove from the heat and allow to cool as well. Using a small spoon, scoop out the cores of the cooked pears. Cut the pears into 1/2-inch slices. Combine the pears and the onion mixture. Cover and refrigerate for at least 1 day before serving. In my post about Moroccan Spiced Meatloaf, I mentioned that I was at one time blessed to have lived in the buzzing, ethnic heart of Ghent, Belgium’s third largest city and melting pot of all kinds of Eastern cuisines. I first discovered ‘Baba Ganoush’ in a small, dimly lit Turkish restaurant, complete with ornate belly-dancers and Kelim-covered poofs that served as seats around the knee-high, mahogany table tops. We had made our reservations a few weeks ahead of time, but when we arrived, somehow our reservation got botched and we had to wait well over an hour for our table. It turns out that this was actually a blessing in disguise, as the incredibly hospitable owner catered to us with gratuitous grilled pita bread and baba ganoush. Farouk, the bartender who made sure we weren’t thinking about the time that passed, kept the wine & conversation flowing with flair, and in the end, we sort of regretted being escorted to our table. To me, baba ganoush represents the warmth & earthy deliciousness of the flavorful ethnic dishes you find in the many small, family-run eateries in Belgium’s urban areas. Just like Mexican cuisine has become a staple in every day living in California, shoarma, doner kebab & things like baba ganoush are part of every day life in Belgium. 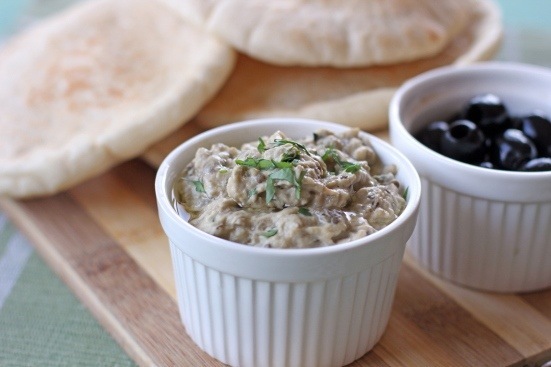 If you’ve never heard of baba ganoush, I urge you to keep an open mind as all it really is, is nothing more than a silky smooth & velvety roasted eggplant dip. It’s truly a bit of heaven in a small bowl. It’s perfect on bread or with pita chips, but also as a dip for roasted vegetables or a spread for sandwiches. It’s very versatile, and you’ll understand why the minute your lips meet this Middle-Eastern treasure. (*) Tahini is a paste that is similar in texture than peanut butter, but made from sesame seed, instead. It can usually be found at local specialty grocery stores. Heat oven to 375F (200C). Wash eggplant and prick them all over with a fork. Roast in the oven, whole, for approx. 45-60 minutes until the skin is blackened and the flesh is soft. Let cool and peel eggplant. When they are soft and perfectly roasted, this should be very easy. Slice off the top of each eggplant and place peeled flesh in a large bowl, together with the garlic and spring onion. Purée with a hand mixer until you get a smooth consistency, or mash it all by hand with a fork. Add the tahini, lemon juice, goat cheese, spices and chopped parsley, and stir together until well combined. Season with salt & pepper to taste. Add a pinch of cayenne pepper for a bit of heat. Heap chopped olives on top. Drizzle with olive oil, sprinkle some toasted pine nuts over the top, and serve with wedges of pita bread or grilled toast. My Belgian roots seem to trump any American traits I have adopted over the years when it comes to French fries. For instance, I will not settle anymore for plain old non-flavored coffee, but I still like the creaminess of mayo with my steaming hot & crunchy fries. It’s considered an oddity here in ketchup-loving California, but I bet the epicenter of mayo-based casseroles balmy Southern states share my dipping joy. So when I was introduced to a California institution named ‘In & Out Burger’ by my American family, and was told with much excitement that this red & gold vinyl circus was the Mecca of all hamburger joints, I was highly disappointed there was not a drop of mayonnaise to be had. At the time, I already had a wee bit of a chip on my shoulder as fast food is not exactly my idea of culinary sophistication, so I may or may not have had a an air of superiority about the whole thing. I plead the fifth. Not being able to drown my fast food sorrow with a vat of mayonnaise, probably put me over the edge. “Try the animal sauce…” , Scott proclaimed, “…you’ll like it”. I’m sure I must have looked at him with an air of complete disbelief, but I aim to please and reluctantly bit the corner of a little plastic pouch of animal sauce, and – with some trepidation – squirted some on a ‘test fry’… I swear, I heard the faint sound of violins and saw rosy-cheeked cherubs blowing kisses in my general direction. Honest to God! I figured animal sauce can’t be that hard to recreate as my taste buds instantly recognized its delicious mayonnaise base. It was just a matter of adding a few things to it. I listed a recipe for basic mayonnaise here, as well as my own recipe for In & Out’s animal style hamburger sauce. Since mayo is an emulsion, it’s an important to use room temperature ingredients. If you keep your egg in the fridge, take them out about 30-45 minutes prior to making this mayo and let them warm a bit. When at room temperature, separate the yolks and discard the whites. In regards to the oils, olive oil has amore pronounced flavor then safflower or cannola oil, so use light olive oil or any other light oil if you don;t care for the flavor of olive oil. In a stainless steel bowl, whisk yolks, mustard and vinegar together until smooth. Add salt & white pepper to taste (using blackpepper will leave little flecks of black in your creamy mayo). Now here comes the tricky part… You will need both hands, so make sure the bowl on your countertop is secured. You can do so by placing it on top of a non-skid mat, or by using a cold damp towel that will hold your bowl in place whil you whisk. Adding the oil to your egg-mustard mixture is where things can go wrong. Gently and in a steady motion trickle oil into the egg & mustard mixture one drop at a time, whilst whisking constantly. When the emulsion is beginning to thicken, you can go from droplets to a thin stream and so forth. You will need pretty much all of the oil, but when you see it is getting harder to incorporate the oil, it means you are reaching the limit. If this is the case, stop adding oil as otherwise you risk your mayonnaise separating again. If your mixture is not thickening, you are liking whisking too vigorously so slow down a bit. The pace of whisking should be steady, but neither too fast nor too slow… it’s a learnt art! 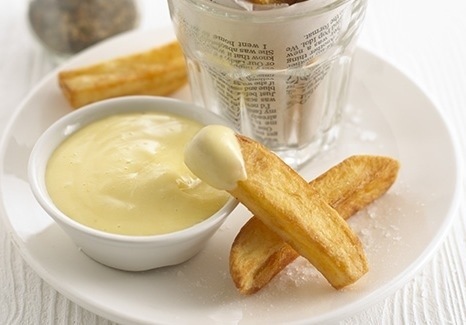 When you have achieved a beautifully creamy sauce, add the lemon juice and some more salt & pepper to your taste. Enjoy your homemade mayo! (*) You can also add herbs to flavor your mayo, such as finely chopped fresh tarragon for a French twist, minced garlic for a traditional aioli or a few drops of sriracha sauce for a spicy fiery mayo. The possibilities are endless. Whisk all ingredients together and enjoy on a hamburger bun with your favorite hamburger, cheese, lettuce, tomato & onions! Yum! Yesterday, whilst browsing for dinner ideas at our local market, we happened to walk past the fresh seafood display, when Scott stops dead in his tracks, points at the iced trays of salad shrimp and says: “Should we pick up some of these for shrimp-boy? !”, shrimp boy being one of the selfish opportunists we adopted from the shelter. Ever since we introduced his feline highness to his kitty-cocaine, he’s seriously addicted. And for only about $4.00/lbs, how could we resist? Seeing those bright pink, plump little salad shrimp, jogged my memory and brought me back to sweltering Belgian summer days and shrimp-filled cold tomatoes with cocktail sauce. “Tomattes Crevettes” they were called, and they tasted delicious in the oppressing 90F degree heat that would occasionally envelope our garden patio during Summer. I think one of the biggest food-disappointments I’ve experienced when I first moved here, was undoubtedly cocktail sauce. I remember first seeing it on the menu at a seafood joint in New York City and sharing my excitement with a few co-workers at the time. I had only been in the country for a few weeks, and seeing something familiar that reminded me of home somehow made me happy. When the bowl of iced shrimp made it to our table, I was confused about the dipping sauce and thought perhaps the kitchen staff made a mistake. It wasn’t the creamy, salmon-colored deliciousness that hugs your taste buds, but a harsh, slightly acidic bright red tomato sauce. I could discern horseradish, which seemed even stranger to me, but I was assured by my colleagues that this was indeed cocktail sauce. In the thirteen years I’ve been blessed to live here, I never touched American cocktail sauce ever again. 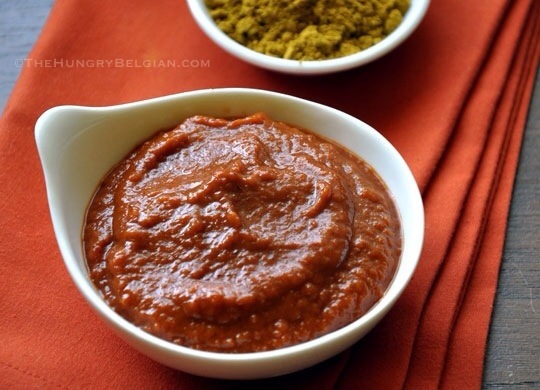 Below is the “Flemish” version of this beloved seafood dipping sauce. Whisk cream by hand until slightly fluffy but still runny. Gently fold in ketchup & mayo until well combined. Add whiskey & tabasco sauce, and stir into a smooth sauce. Garnish with a basil leaf. Serve with cold seafood or raw vegetables. Since I posted a recipe for homemade ketchup yesterday, it’s only befitting that I would post one for mustard today. After all, ketchup & mustard belong together like Siegfried & Roy. Seperate them, and – well – things are just not right. While it’s not a Belgian invention, mustard is another one of those Belgian staples. It’s served alongside everything. If you hail from a small Flemish country town like I do, you surely remember the annual Summer ‘Breugel Feesten’ where you are traditionally presented with a plate of diced gouda & paté of pheasant or wild boar, served alongside a bowl of zesty ‘cornichons & ajuintjes’, tiny little pickled dill gerkins & onions… all to be washed down with a nice dark Leffe ‘van ‘t vat’ (Leffe beer on tap). Mustard is ridiculously easy to make, albeit a bit time consuming as it requires some planning ahead. You’ll find many mustard recipes online, but the basic recipe below comes from my very own grandma Jozefa, bless her soul. She made sure that I understood the importance of using non-reactive utensils and unsuccesfully taught me the virtue of being patient. Mustard is really nothing more than a combination of ground (or powdered) mustard seed and some sort of liquid, blended together with any flavorings you fancy. For a spicy and flavorful mustard, always use a combination of yellow, brown and/or black mustard seed. Yellow seed is fairly mild and – when used alone – typically yield a ‘flat’ or very mild mustard. For a bolder flavor, you need to add some black mustard seed. 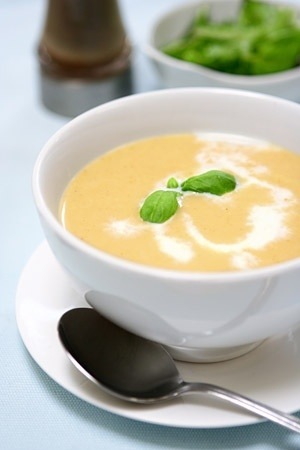 When adding the liquids to the ground mustard seed, the temperature of the liquid makes a difference too: hot liquids yield a more mild mustard whereas cold liquids give it more kick or bite. The longer mustard ‘sits’, the milder it gets. Don’t be alarmed if your mustard tastes too spicy right after you made it, it’ll definitely ‘calm down’ in a few days to a week. Place the mustard seed in an airtight glass (or non-reactive) jar with the water and vinegar. Shake well and let sit for 24-48 hours. In a food processor (or with mortar & pestle), pulverize the soaked seeds until you get a nice creamy paste. This takes a bit of time, so be patient. For a more grainy mustard, blend less. For a creamier mustard, keep on blending until you achieve the desired creaminess. Add a bit more water one tbsp at a time if it all turns out a bit too grainy and dry. Also, homemade mustard is not quite as ‘yellow’ in color as store-bought mustard. If you fancy that yellow color, add a dash of kurkuma for color. Use basic recipe above, but replace water & vinegar with 4.5oz of full-bodied red or amber ale (or stout), and 2.5oz of champagne vinegar. Once blended, add 1-2 tsp of finely chopped fresh thyme leaves. Use basic recipe above. When the mustard is blended to your desired creaminess, add a 1-2 tbsp of honey and a whopping tbsp of chopped dill. 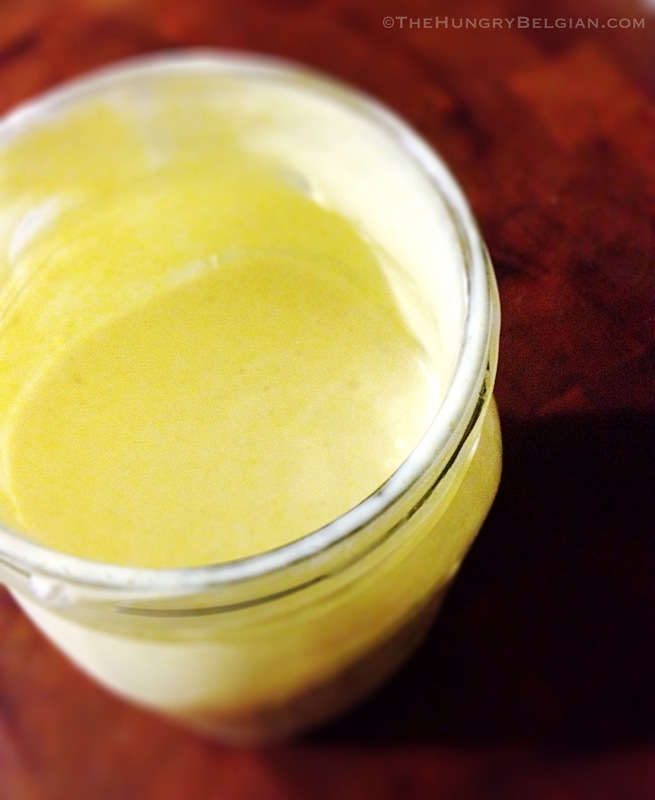 Homemade mustard lasts approx. 1 month in an airtight container in your refrigerator. Before using, allow it to sit for approx. 5 days so the ‘fire’ dies down a bit and the flavors have a chance to blend together. With grilling season wide open, I can’t thank my foodie friend Debi at Life Currents enough for posting her delicious homemade ketchup recipe. Debi, seriously girlfriend, I bow to your culinary genius. Now, I wouldn’t be a full-blooded Belgian, if I didn’t turn this saucy deliciousness into an authentic Belgian staple: curry ketchup. It’s one of those things that I was forced to abandon when I came to America… Or so I thought. Nothing screams Belgium more than a good old paper cone baggie of crispy hot fries, accompanied by a zesty curry wurst (frikandel) with freshly diced onions and curry ketchup. It’s how we roll in Belgium. In a medium sauce pan, combine all ingredients and bring to a boil. Turn heat to low and simmer for 10-15 min. Let cool and store in an airtight container in the fridge. For regular ketchup, omit the curry and cayenne pepper, an “up” the brown sugar to 1tsp, instead of 1/2 tsp… or head on over to Life Currents!